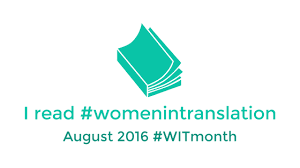 Although Irene Nemirovsky only features on my blog once (The Dogs and the Wolves way back in 2010), she is, in fact, a writer whose work I have steadily devoured as it has been translated into English (largely by Sandra Smith). 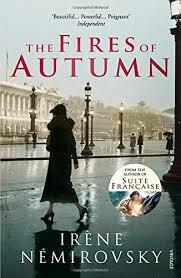 The Fires of Autumn is (as far as I know) her final book – both in terms of translation (published in 2014, nothing has appeared since, and I suspect all her major work is now available in English) and also her final completed novel, written around the same time as Suite Francois and published posthumously in 1957. Therese is destined, however, for the twenty-seven-year-old Martial Brun, who is training to be a doctor. We also meet his friend, the charismatic Raymond Detang, and Madame Humbert and her daughter Renee, who survive by selling hats since Monsieur Humbert died and left them penniless. These are the middle classes: not poor, but not rich enough to put money out of their minds. Nemirovsky is not suggesting that corruption entered French society with the war, but that it infected the middle classes who had previously been excluded both by snobbery and a sense of propriety. Bernard is torn between the morality of the past and the attraction of easily acquired wealth, as we see in his love for Therese and his affair with Detang’s wife, Renee. This allows Nemirovsky to demonstrate these tensions using the relationships, for example when he invites Therese and her mother to his (luxurious) home only to fail to appear. Nemirovsky, of course, did not survive the Second World War and was therefore tasked with concluding her story before reality had concluded its. The title comes from Madam Pain’s comment that “these are the autumn fires; they purify the land; they prepare it for new seeds.” In many ways, for Western Europe at least, this is what happened; in the UK the lives of ordinary people were vastly improved after World War Two. As we begin to undo these improvements, the warnings of Nemirovsky’s novel become more relevant. What separates these “three distinct regions” is wealth. While those at the bottom struggle to survive, facing not only poverty but the threat of anti-Semitic violence, those at the top remain aloof and secure behind their “gilded gates”. Nemirovsky understands that while wealth may divide families from their roots, this is because it unites the wealthy. For Jewish families, however, that class unity, as no doubt she was already aware in 1940, was a very fragile one. The fragility of their existence is something that permeates the novel, the transition from the Ukraine to Paris, from poverty to wealth, from unhappiness to happiness notwithstanding. Interestingly, almost everything that is gained in the novel is also lost, and it is peopled with characters who move from place to place, either following their dreams or escaping from their nightmares. When Ada, having attained her dream, renounces it, she is not only making a sacrifice out of love, but, it seems to be suggested, facing up to reality. Nemirovsky’s view of this seems as complex and uncertain as her relationship with her own Jewishness. You are currently browsing the archives for the Irene Nemirovsky category.